Given their moniker of choice, I figured The Heartbeats were a no-brainer to tie in with Valentine's Day. Too bad I don't have much in the way of background details to offer, or for that matter an original copy of the disk. I've had it on my hard drive for almost three years, but don't have the foggiest idea of where I snatched it from (a defunct blog or Soulseek perhaps)? This mop-topped trio, ostensibly hailing from the UK, are imbued with traces of Badfinger, The Records, Flamin' Groovies, Eddie & the Hot Rods, not to mention Beatles homage in spades with a singer who often smacks of Paul McCartney. 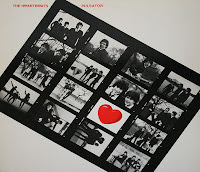 Plenty of straight-up power pop here, most capably exemplified by "Look at the Eyes" and "Thinking of You" Pulsator gets even more cracklin' with "Stuck on You," three perfecto minutes of infectious Fab Four inspiration, by way of a Flamin' Groovies-esque delivery system. Elsewhere, faint but discernible pub rock maneuvers crop up, as does the occasional flashy guitar solo. I'm stupefied that a record of this caliber has gone so utterly overlooked, given that big swaths of Pulsator exude the type of acumen and timeless aplomb of the lost classic that it's frequently tantamount to. I like this record too. I think it's hard to find info because of other bands with the same name etc. They might actually be from Germany? Seems like the record was only released there and maybe the Netherlands. They sound to Anglo to be from Germany, but I could be wrong. When I was trolling the web for band info I saw a reference about this record being released in the Netherlands, but not much beyond that. Please could u be so kind as to re-up this album? but I'm dying to find out.